I am wary of using the label “geek” too much and too often, but it is hard to escape its use these days. It seems that there is a geek for all sorts of things, so might as well not try to ignore it. In any case, the stereotype seems to remain. Geeks and physical activity are strange bedfellows. Geeks like sitting in front of their computers or whatever gadget they prefer. Geeks are overweight. I know this is not always true, but this is the premise of the guy behind Weight Hacker, a book in the works which some of you might find interesting. Like many geeks, I grew up playing D&D, hacking on computers, watching TV and reading a lot of science fiction books. And like many geeks, I was overweight, rarely got exercise and ate poorly. At my heaviest I was 225lbs, and at 5? 7? I fell squarely into the “obese” category. Whether or not you agree with the stereotype, if you need to shed some pounds using a “different” method, you might want to check out Weight Hacker, the site where it all started. What can be interesting about the concept is that it does not bring a new set of fashionable diet and exercise tips. Instead, Weight Hacker takes on an approach that might be more effective for certain patterns of thinking. Again, we risk riding upon the back of stereotypes, but the idea is this. 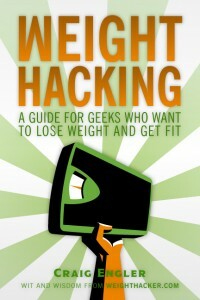 Weight Hacking is simply an operating system for nerds that shows them easy ways to incorporate better eating and sound nutrition into a geeky lifestyle. It also explains how geeky passions like playing games, surfing the Web, reading, and a love of gadgets can be some of the best tools to lose weight and get fit. Nerd. Geek. It doesn’t matter much, I think. What is important is if you want to take on this approach and if you engage in the above activities a lot, and you think you need to work on your health. What do you say? Check it out? Geeks and nerds are two different stereotypes. Just about all geeks I know are overweight, whereas the majority of nerds are not.